New York Yankees star catcher Gary Sanchez, who hit 20 home runs in 53 games in his rookie season in 2016, may or may not be the next Mickey Mantle in the Yankees lineup. But the powerful 24-year-old is following in The Mick’s footsteps in another way for Yankees fans and card collectors—the storied No. 7 card in the recently released Topps® 2017 Series 1 Baseball set. Card No. 7 had been reserved for Mantle since his death in 1995. Beginning with the 1996 flagship set, Card No. 7 had been either Mantle or, for a few years, no one. That meant a gap in the checklist for the years in which Topps did not have an agreement with the Mantle estate to include his card in that particular year. Enter Sanchez, whose exploits earned him runner-up status in the American League Rookie of the Year voting, despite playing less than half the season in pinstripes. 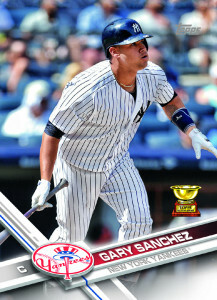 The Sanchez card was issued earlier this month along with N.L. MVP Kris Bryant‘s No. 1 card, the “Ultimate Card Giveaway” of two million cards from throughout Topps’ 66-year history and a series of First Pitch™ insert cards in its Series 1.